Happy Thursday! I’m ready for the weekend, and I can guarantee you all are too. 🙂 It’s been a busy week! I’ve taught back-to-back Jazzercise classes each night (except last night), and the Jazzercise marathon will continue this evening right after work for another double-header. Woo! I’m just about jazzed out for the week. I teach one class after work tomorrow night, and then I’ve promised myself a completely lazy and relaxing evening after that. Nick should cook dinner for me, right?! Right….I’ll pass along the hint. HA. I’m going to technically start my 14 week training plan for my half marathon starting next week. But this week, with the days I had left, I was trying to squeeze in a couple runs to stay on track with my training that I was already kinda doing for my 10K last weekend. Having to teach 2 classes tonight kinda threw of my game plan, so I woke up with enough time to squeeze in a 3 mile easy run with Mac this morning. We woke up around 5:30, and Mac was busting out the door before I could barely get his leash on. Over the past week, I’ve realized Mac can actually run fairly long distances as long as it’s not super hot. He’s been on two runs with me now (3.5-4 miles each), and we’ve only taken 1 walking break each time, aside from the multiple potty breaks which are a must for him! We set out on a 3.5 miler that we took pretty easy with a 1 minute walking break. I didn’t want to kill myself, so he keeps me at a nice, steady pace. It felt good to wake up my sore legs from my longer run yesterday though, and I was nice and sweaty when we returned home. The temps were in the mid-40’s – nothing terrible. I’m hoping for some cooler temps this weekend so my body can get used to running long distances in cold temperatures. Once Mac and I made it home, I took a super quick shower and got him ready to go again as he had an appointment with the groomer, a.k.a. doggie spa day! I always drop him off on my way to work for his 8 AM appointment, and then I pick him up during my lunch hour. I’ll have to post the fresh and clean Mac photos later – this doggie momma was rushing around and forgot to take pictures of my handsome boy! 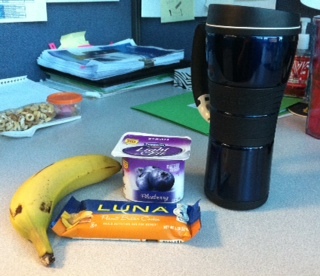 Breakfast was once again quick, eaten at my desk, and I was still loving my Luna bars this morning! Peanut butter cookie Luna bar definitely gets an A+ in my book. 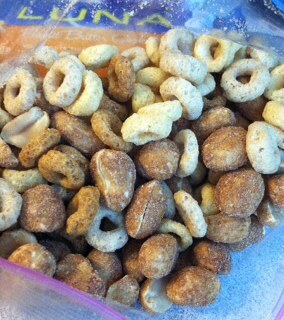 And I also threw together a quick mix of Multi-grain Cheerios and peanuts to snack on mid-morning. Yum! No matter how short the run, if I run in the morning before work, I’m starving and needs lots of little snacks to make it through until lunch time. This mix did the trick! Since I had the night off last night, I decided to take some time to sit down and make up a training plan for my first half marathon! Like I mentioned yesterday, I signed up for my first half marathon this week. I’ll be running in the St. Louis Track Club’s Frostbite Series on January 25. I’m beyond pumped, and I’m really excited to start training as well. It will be my biggest feat yet when it comes to fitness, and I can’t wait to stomp all over my main goal: finishing the race! I’ve read a lot about running my first half marathon, and I think it’s best for me to not set any goals for my finishing time. I just want/need to focus on finishing the race and having fun with it. I figure Nick will come on some training runs with me to help push me along through these cold months of running I have ahead of me. While I was making up my training plan last night, I knew I would have to incorporate my Jazzercise classes as my ‘cross-training’ days. I looked up some other plans, like Hal Higdon, etc., and I’ve loosely based my personal plan off of others I came across. This is what I came up with! Download a large jpeg here. Or download the Excel version here! I’m doing a 14 week half marathon training plan, but this week currently marks 15 weeks til race day, so I went ahead and put my runs on there from this week and marked it as my ‘start’ week. Just because! I also marked my upcoming 24th birthday, Thanksgiving, Christmas and New Year’s! 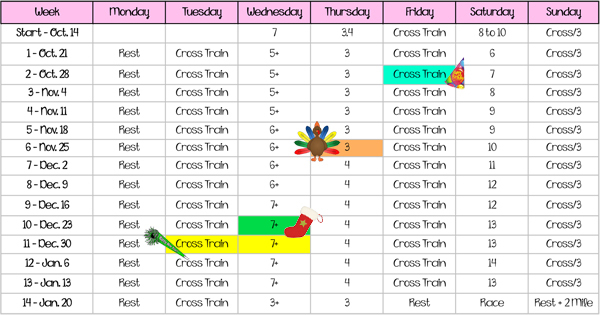 The holidays could make my training a little difficult for a few weeks, so I hoped by marking them way in advance, I’ll be able to make plans to fit them in somewhere. I want to be able to run 4 days a week, and possibly 5 on Monday evenings depending on how my body is feeling. For now, I am scheduling cross-training on Tuesdays and Fridays. On Tuesdays, I always teach 2 Jazzercise classes, and on Fridays, I have 1 class right after work. Then on Sunday mornings, I also teach 1 class, but I’ve often gone for a shorter run before teaching and have felt awesome during class. So I want to continue this during my training. Saturdays will be my ‘long run’ days because I don’t teach at all and should usually have time. But if not, I can always shift my long runs to Sunday if needed. Is this more info than you bargained for? Probably. But I’m just trying to justify the reasoning behind my plan. 🙂 Plus looking at this plan makes me a little nervous, so just ‘talking it out’ helps me the most! BTW, this is off subject, have you guys been indulging in any of the Halloween candy?? A lot of this has been happening lately around my office. Sugar highs for everyone! Woo! 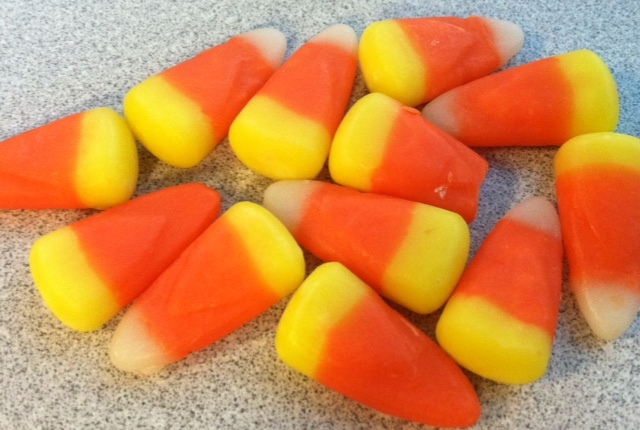 I’ve successfully stayed away from most of the terrible-for-you candy except for the candy corn. I can’t help myself! Well I hope you have a wonderful Thursday! Like I mentioned, I’ll be teaching 2 classes right after work, so you won’t see me until tomorrow. Have a great evening!